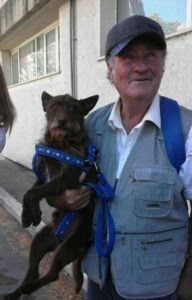 A 72 year old man from Lampedusa finally found his dog in Tuscany after a week’s separation. A retired shepherd, with no living relatives, was on a train accompanied by his faithful Rochi to Naples from northern Italy when at 3 am during a stop at the Grosseto station he went to the restroom. Upon his return to the compartment, the train had already started moving and the dog was gone. After a massive hunt that lasted a week, thanks to photos the animal was identified as roaming near the Grosseto station. A benefactor in Florence paid round trip airfare and a hotel room in Tuscany for his owner so he could aid in the search together with personnel from the local animal protection society. A day after his return, the pensioner was finally reunited with Rochi on via Monterosa. After spotting him at a distance, whistling and calling his name, the dog bounded into his arms. Now back to home, sweet home for both of them. To read more in Italian, and to see a photo gallery and video, visit Florence’s La Repubblica news site.